Cadillac was once the "Standard of the World," which was more than an advertising slogan. The competition is much deeper, wider and stronger today, but if you would like an unassailable reason to own, enjoy and be proud of a Cadillac again, this is it. If nothing short of an import luxury brand will do, there are many fine alternatives from the likes of BMW, Mercedes, Audi, Jaguar, Lexus and Infiniti. Fresh from a complete makeover in 2008, the 2009 CTS has no major changes. The 2009 CTS imparts a dramatically different interior design theme for Cadillac, with emphasis on tasteful ornamentation and hand-crafted details. The instruments, vents and other elements are framed in chrome, the center stack blends seamlessly into the lower instrument panel and console and hand-cut, hand-sewn and hand-wrapped coverings with French stitching are used throughout. The heated and ventilated front seats use "thin-seat" technology for improved rear leg, knee and foot room. Available soft, white LED backlighting in the door-pulls, footwells and between the upper and lower instrument panels creates an effect similar to recessed lighting in contemporary homes. The new look of the 2009 Cadillac CTS is characterized by a bold two-segment grille, chrome side air extractors and sculpted fenders emphasizing its wider tracks and more athletic chassis. Flanking the lower grille, below the vertical headlamps, are chromed wrap-around slots for additional air intakes and fog lamps. The fast-sloping roofline is nearly coupe-like in profile, the large vertical taillamps refine Cadillac's recent practice, the trunk-top center brake light doubles as an aerodynamic spoiler and an available double sunroof offers an open-sky view for both front and rear passengers. Our extensive CTS driving experience began on a California race track and extended through many twisty two-lanes, fast freeways, urban congestion and mixed-speed suburban sprawl, most of it in a performance-package model with the strong-performing 304-horsepower direct-injected V6. We expected the trade-off for its responsive steering, world-class road-holding and powerful braking to be an uncomfortably stiff rough-surface ride but found its suspension surprisingly supple even on the most troubled surfaces. We loved the posh, quiet cabin's cheerfully luxurious design, the multi-adjustable seats were uncommonly comfortable over the long haul and every control was easy to see, find and operate. This fine new midsize Cadillac can compete on equal terms with anything in its class. Cadillac's midsize 2009 CTS is a legitimate BMW 5 Series competitor at 3 Series prices. With a starting Manufacturer's Suggested Retail Price (MSRP) of about $37,000, it's roughly on par price-wise with the 3 Series and $2,000-$3,000 more than the Mercedes-Benz C-Class and the front-wheel-drive Lexus ES 350. All three of those "entry luxury" sedan competitors are EPA-rated as "compact," and the two German entries start with much less-powerful 3.0-liter six-cylinder engines compared to the base 3.6-liter V6 of the CTS. On the resale side, the CTS should retain somewhat more of its value five years down the road compared to the C-Class and 3 Series, and remain pretty even with the ES 350. Direct-injected V6 models start roughly $2,300 higher, while the top-of-the-line "Premium Collection" package adds over $10,000 and the 18-inch performance tire, wheel and sport suspension package goes for almost $3,000. The base CTS is powered by a 263-horsepower 3.6-liter V6 driving through a six-speed manual transmission and rolls on all-season tires on 17-inch aluminum wheels. Inside its cabin are dual-zone climate controls, an eight-way power driver's seat, a Driver Information Center, a rear-seat/trunk pass-through and an eight-speaker AM/FM/CD Bose audio system with XM Satellite Radio and MP3 capability. Standard safety and security equipment includes advanced front, side and side-curtain airbags, Stabilitrak stability and traction control, daytime running lamps, Twilight Sentinel auto lamps, programmable power door locks, a theft-deterrent system and one year of OnStar security and convenience service with turn-by-turn navigation. The available "Luxury Collection" package includes upgraded seats, sound system and additional luxury features. The "Performance Collection" adds 18-inch wheels and tires, FE2 Sport Suspension and High-Intensity Discharge headlamps with adaptive forward lighting, while the "Premium Collection" offers wood trim, a 10-speaker Bose 5.1 premium audio with a 40-gig hard drive and radio rewind and pause, iPod integration, GPS navigation and EasyKey keyless entry and ignition. Major stand-alone options include the 304-horsepower direct-injection V6, six-speed automatic transmission, all-wheel drive, Ultraview roof, Bose premium audio (with or without navigation), the FE2 Sport Suspension and FE3 Performance Suspension on high-performance "summer" tires. Surrealistic sound with 40-gig hard drive and iPod integration. It will download and store your CD collection and operate your iPod from the pop-up touch screen. Offers real-time traffic and weather, expanded voice prompts and 3-D imaging of major landmarks. While its large center dash-top touch screen pops up fully on demand, the top portion peeks out to display key information even when stored. The 2009 CTS offers two levels of 24-valve, double-overhead-cam, variable-valve-timing 3.6-liter V6 power, and the up-level version boasts power- and efficiency-enhancing direct fuel injection. Standard transmission is a six-speed manual, while a six-speed automatic and all-wheel drive are optional. When GM set out in the late 1990s to resurrect its once-proud Cadillac brand, the public process began with Evoq, the 1999 stealth-fighter concept sports car that eventually evolved into the production 2004 XLR. 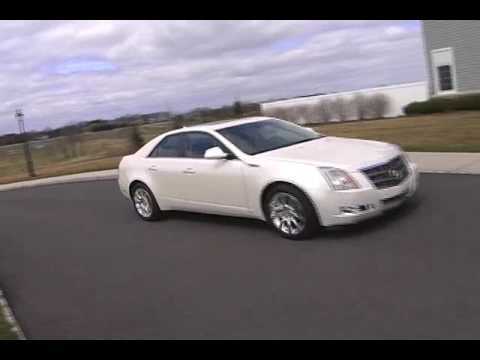 But the 2003 all-new "entry luxury" CTS sedan brought this new Cadillac look and personality to market first. Its "Art and Science" theme was a bold blend of space-age style and technology, and its edgy styling was polarizing - some liked it, some didn't. But it delivered the right stuff in performance, features and road dynamics, while only its austere interior caught critical flack. For 2009, Cadillac has perfected the formula, bringing a CTS to market that has won rave reviews from critics and customers alike. Cadillac CTS -- the stylish performer with the driver in mind. I love the styling of my Cadillac CTS. Even though it's going on 10 years old, it still looks brand new. That's probably because I keep it well-maintained and garaged when not in use, but also due to the quality styling. It is a luxury car that is also high performance, even though it's not the high-end performance version model. I'd probably go for another vehicle from Cadillac, if the price and incentives are right. Style and elegance with dependability. My car is gorgeous! Very comfortable. The interior is beautifully designed as well as comfortable. I feel safe because its heavy and sturdy. You can tell how sturdily it is built simply by closing the door. The cockpit is beautifully designed with subtle lighting which is concealed and produces a faint glow. The moonroof is an added feature that I enjoy when weather permits. It is luxurious and looks great. It is very comfortable and accelerates well. No problems besides unsatisfactory gas mileage. It is very comfortable and accelerates well. No problems besides unsatisfactory gas mileage. It is very comfortable and accelerates well. No problems besides unsatisfactory gas mileage. It is very comfortable and accelerates well. No problems besides unsatisfactory gas mileage.